Over the past 5 years there has been an incredible transformation in digital advertising. The volume of ads and their presence on digital platforms is exponentially growing. In 2017, digital ad spending reached $209 billion worldwide. The amount of money spent on digital advertising surpassed TV advertising for the first time. As consumers, our shopping experience has been completely transformed by digital ads. No matter what we’re doing on our digital devices, whether it’s browsing the web or playing a game, ads seem to take up some prime real estate on the screen. Fortunately, we have experienced the development of highly specific, targeted ads so those ads are actually relevant to us. However, there are still times when ads get in the way of things, but Facebook just figured out a way to make them even better! Facebook just took things to a whole new level. 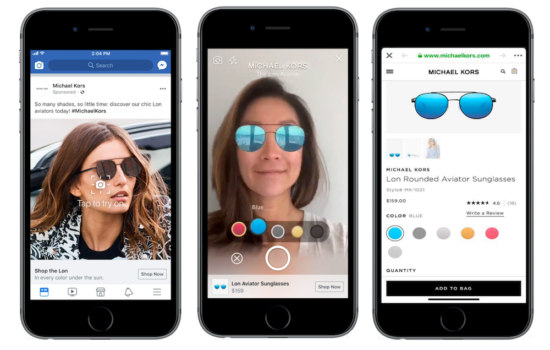 With Facebook’s newest augmented reality ads advertisers can show off their products in a completely new way. You can try on the newest, limited edition pair of sunglasses or try on a new makeup using AR capabilities. These augmented reality ads still look like the ads you were previously seeing on your News Feed, but they include a small caption that says “Tap to try it on”. When you tap it, the AR capabilities are opened. This new ad experience is bridging the gap for customers who like to try on items before purchasing them. You can skip the next trip to the shopping mall and make the decision to buy without ever stepping foot in a store.